Vaughan is a very fast-growing city that is located north of Toronto in a region that is known as York. Vaughan is often also called the "City Above Toronto" and it is a city with budding manufacturing and industrial sectors that are attracting many new residents to this area every year. Furthermore, due to its close proximity to both downtown Toronto and many major transportation hubs, Vaughan has very quickly become a very desirable place to live, work and play. Vaughan is home to the very popular Canada's Wonderland. Canada's Wonderland is Canada's largest amusement park and it is a fun-filled family park full of rides, games and a water park. It is open from May until October and it is one of Toronto's most beloved attractions. Vaughan is also where the famous McMichael Canadian Art Collection is housed as well as the fashionable Vaughan Mills shopping mall. 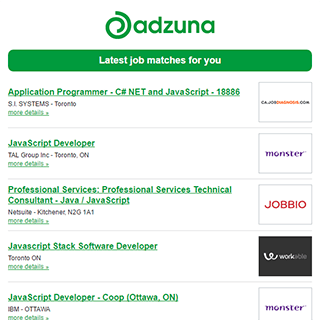 The Adzuna recency index score for this search is 0.74, suggesting that demand for job vacancies in Vaughan is decreasing. 31 new job listings for this search have been found in the last calendar day, compared with 52 in the last 72 hours and 165 in the last week. Get the latest Jobs in Vaughan delivered straight to your inbox!